LASIK corrective eye surgery is intended to help restore vision in individuals with poor eyesight. When an individual goes to receive LASIK corrective eye surgery, he or she does not expect to walk out with worsened eye vision. If an incompetent surgeon has worked on your operation, then it may be possible that your vision is worse than the first moment in which you walked into the surgeon’s office. What Is LASIK Corrective Eye Surgery? The U.S. Food and Drug Administration (FDA) reports that over 1 million people receive LASIK surgery or another type of corrective eye surgery every year. Unfortunately, the FDA also reports that about 50,000 people experience a loss of vision due to medical malpractice. This is a significant number of people that suffer from loss of vision as the result of a doctor’s negligence during eye surgery. This loss of vision may be due to any number of factors that will be discussed below.It is vital that individuals are aware of the risks of undergoing LASIK eye surgery, and a surgeon has a duty to disclose these risks to patients before surgery. This process helps a patient make an informed decision as to whether LASIK eye surgery is truly the best option for them. How Do Surgeons Make Errors in LASIK Procedures? During the initial appointments before LASIK eye surgery, it is up to a doctor or surgeon to determine whether an individual is a candidate for this type of operation. If a patient has extremely poor vision or certain medical illnesses, then he or she may not be the right candidate for the surgery. Problems can arise when surgeons are desperate to have business and state that virtually any patient is a candidate for this surgery. If you only received LASIK surgery based upon a surgeon telling you this, then you may have a legal claim against the surgeon. An eye surgery malpractice attorney can assess your case to determine whether a doctor told you that you were a proper candidate when in reality you may not have been the right candidate for this surgery. Surgeons may also make errors during an operation if they are not paying attention to the surgery at hand. If the focus of a surgeon strays during an operation, then a patient’s vision can be permanently altered for the rest of his or her life. A surgeon may simply be careless and may use the wrong tool to perform one of the techniques needed during a surgery. In the case of LASIK procedures, there have been reports of surgeons severing the optic nerve resulting in irreversible vision loss. There are numerous ways in which surgeons can negligently perform during operations and have a very negative impact on the lives of patients. These serious injuries show just how important it is for surgeons to properly screen candidates and engage in a diligent and careful operation. Removing too much tissue has the potential to cause lifelong effects on a person’s vision. This can impede a person’s performance at his or her daily job or otherwise impact that person’s experience of life. There may be damages available for those who have suffered from loss of vision after an operation. Damages may include pain and suffering, medical expenses to fix one’s vision, loss of wages for any work missed after an operation and loss of consortium. 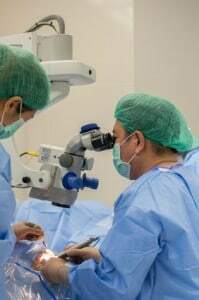 You can speak with an eye surgery malpractice attorney at Rosenfeld Injury Lawyers LLC to receive a calculation of the damages that you can receive for a LASIK surgery error. Patients who have suffered serious vision loss may be entitled to receive damages for: medical care, lost wages, nursing assistance and disability.